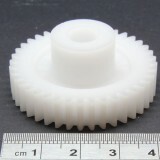 A range of moulded plastic spur gears in 1 mod pitch. 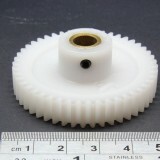 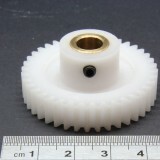 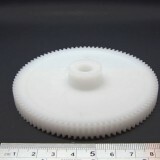 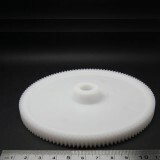 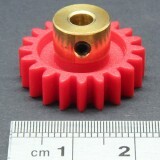 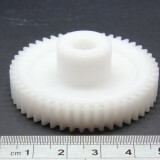 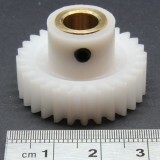 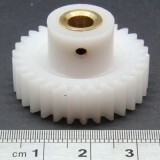 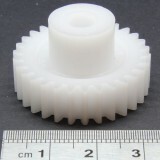 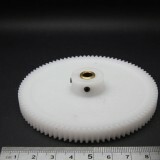 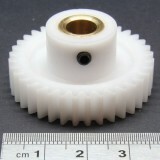 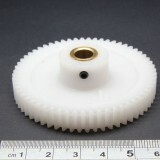 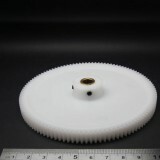 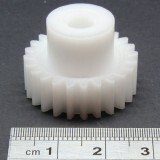 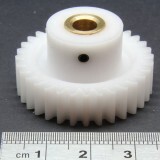 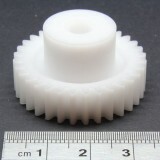 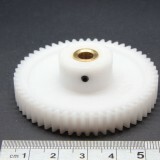 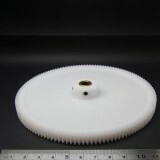 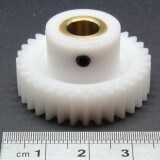 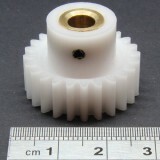 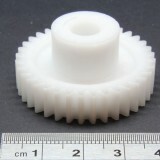 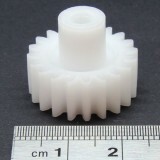 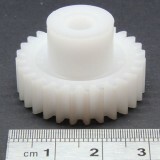 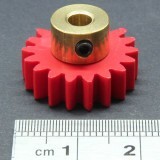 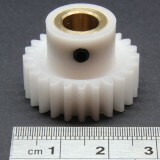 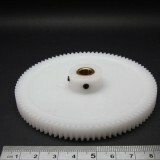 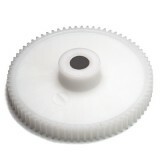 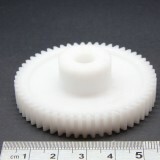 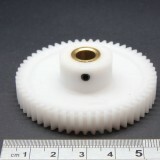 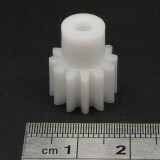 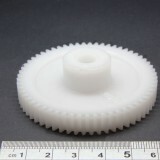 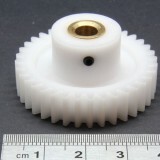 These gears are suitable for a range of applications from model making to robotics and light industrial drives. 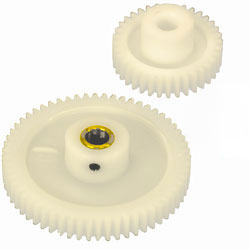 Material: Delrin Acetal with optional Brass insert and Set-Screw. 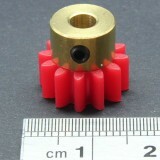 Tooth form: 1 mod full depth involute profile with 20° pressure angle. 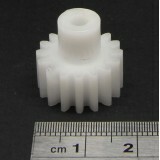 Operating temperature: -40°C to 80°C. 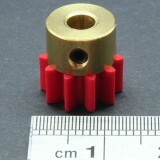 Face width: 6mm + 9mm. 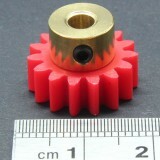 1.0 Mod Spur Gear, 10 Teeth, 4mm Bore with Brass Insert and Setscrew ..
1.0 Mod Spur Gear, 12 T, 4mm Bore ..
1.0 Mod Spur Gear, 12 Teeth, 4mm Bore with Brass Insert and Setscrew ..
1.0 Mod Spur Gear, 15 Teeth, 4mm Bore with Brass Insert and Setscrew ..
1.0 Mod Spur Gear, 16 T, 4mm Bore ..
1.0 Mod Spur Gear, 18 Teeth, 4mm Bore with Brass Insert and Setscrew ..
1.0 Mod Spur Gear, 20 T, 4mm Bore ..
1.0 Mod Spur Gear, 20 Teeth, 4mm Bore with Brass Insert and Setscrew ..
1.0 Mod Spur Gear, 24 T, 6mm Bore ..
1.0 Mod Spur Gear, 24 Teeth, 6mm Bore with Brass Insert and Setscrew ..
1.0 Mod Spur Gear, 24 Teeth, 8mm Bore with Brass Insert and Setscrew ..
1.0 Mod Spur Gear, 28 T, 6mm Bore ..
1.0 Mod Spur Gear, 28 Teeth, 6mm Bore with Brass Insert and Setscrew ..
1.0 Mod Spur Gear, 28 Teeth, 8mm Bore with Brass Insert and Setscrew ..
1.0 Mod Spur Gear, 30 T, 6mm Bore ..
1.0 Mod Spur Gear, 30 Teeth, 6mm Bore with Brass Insert and Setscrew ..
1.0 Mod Spur Gear, 30 Teeth, 8mm Bore with Brass Insert and Setscrew ..
1.0 Mod Spur Gear, 32 T, 6mm Bore ..
1.0 Mod Spur Gear, 32 Teeth, 6mm Bore with Brass Insert and Setscrew ..
1.0 Mod Spur Gear, 32 Teeth, 8mm Bore with Brass Insert and Setscrew ..
1.0 Mod Spur Gear, 36 T, 8mm Bore ..
1.0 Mod Spur Gear, 36 Teeth, 6mm Bore with Brass Insert and Setscrew ..
1.0 Mod Spur Gear, 36 Teeth, 8mm Bore with Brass Insert and Setscrew ..
1.0 Mod Spur Gear, 40 T, 8mm Bore ..
1.0 Mod Spur Gear, 40 Teeth, 6mm Bore with Brass Insert and Setscrew ..
1.0 Mod Spur Gear, 40 Teeth, 8mm Bore with Brass Insert and Setscrew ..
1.0 Mod Spur Gear, 48 T, 8mm Bore ..
1.0 Mod Spur Gear, 48 Teeth, 6mm Bore with Brass Insert and Setscrew ..
1.0 Mod Spur Gear, 48 Teeth, 8mm Bore with Brass Insert and Setscrew ..
1.0 Mod Spur Gear, 55 T, 8mm Bore ..
1.0 Mod Spur Gear, 55 Teeth, 6mm Bore with Brass Insert and Setscrew ..
1.0 Mod Spur Gear, 55 Teeth, 8mm Bore with Brass Insert and Setscrew ..
1.0 Mod Spur Gear, 60 T, 8mm Bore ..
1.0 Mod Spur Gear, 60 Teeth, 6mm Bore with Brass Insert and Setscrew ..
1.0 Mod Spur Gear, 60 Teeth, 8mm Bore with Brass Insert and Setscrew ..
1.0 Mod Spur Gear,72 T, 10mm Bore ..
1.0 Mod Spur Gear, 72 Teeth, 6mm Bore with Brass Insert and Setscrew ..
1.0 Mod Spur Gear, 72 Teeth, 8mm Bore with Brass Insert and Setscrew ..
1.0 Mod Spur Gear, 90 T, 10mm Bore ..
1.0 Mod Spur Gear, 90 Teeth, 6mm Bore with Brass Insert and Setscrew ..
1.0 Mod Spur Gear, 90 Teeth, 8mm Bore with Brass Insert and Setscrew ..
1.0 Mod Spur Gear, 110 T, 12mm Bore ..
1.0 Mod Spur Gear, 110 Teeth, 8mm Bore with Brass Insert and Setscrew ..
1.0 Mod Spur Gear, 120 T, 12mm Bore ..
1.0 Mod Spur Gear, 120 Teeth, 8mm Bore with Brass Insert and Setscrew ..
1.0 Mod Spur Gear, 130 T, 12mm Bore ..
1.0 Mod Spur Gear, 130 Teeth, 8mm Bore with Brass Insert and Setscrew ..
1.0 Mod Spur Gear, 140 T, 12mm Bore ..
1.0 Mod Spur Gear, 140 Teeth, 8mm Bore with Brass Insert and Setscrew ..